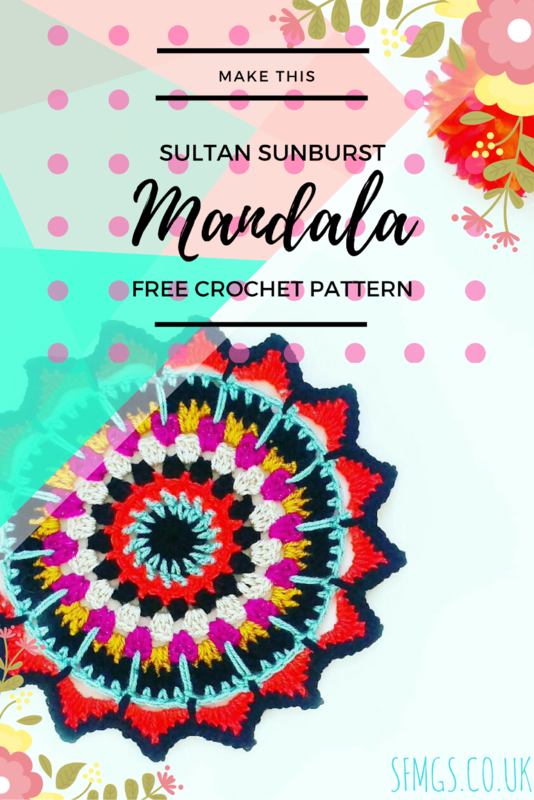 Make this bright and bold crochet Mandala using treble crochet (US dc), spike and puff stitches with a picot edging for this week's free Monday Mandala crochet pattern. 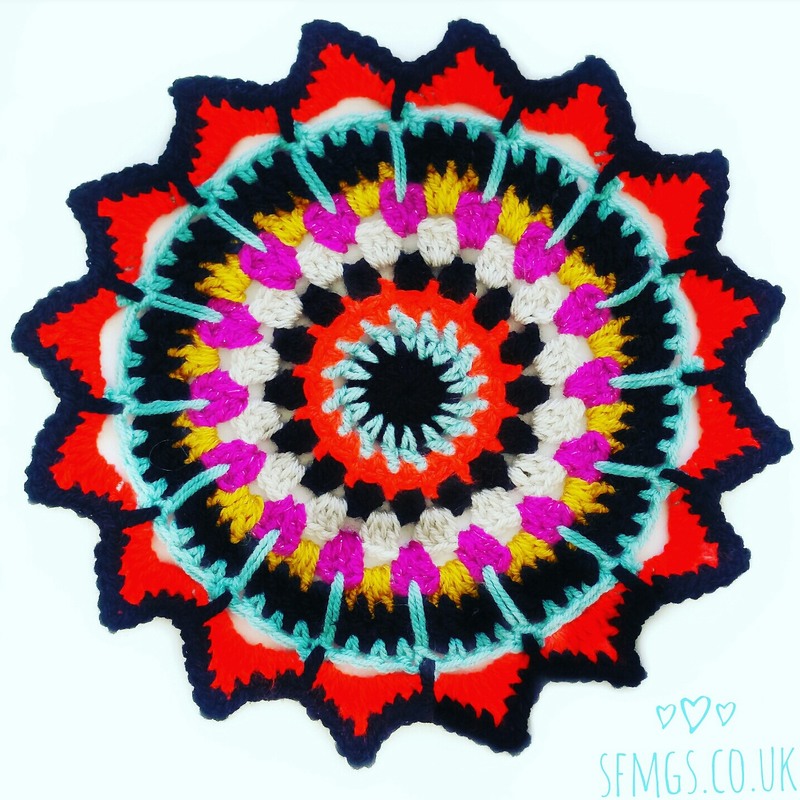 This week's Monday Mandala is a bright boho feast for the eyes and crochet hook! 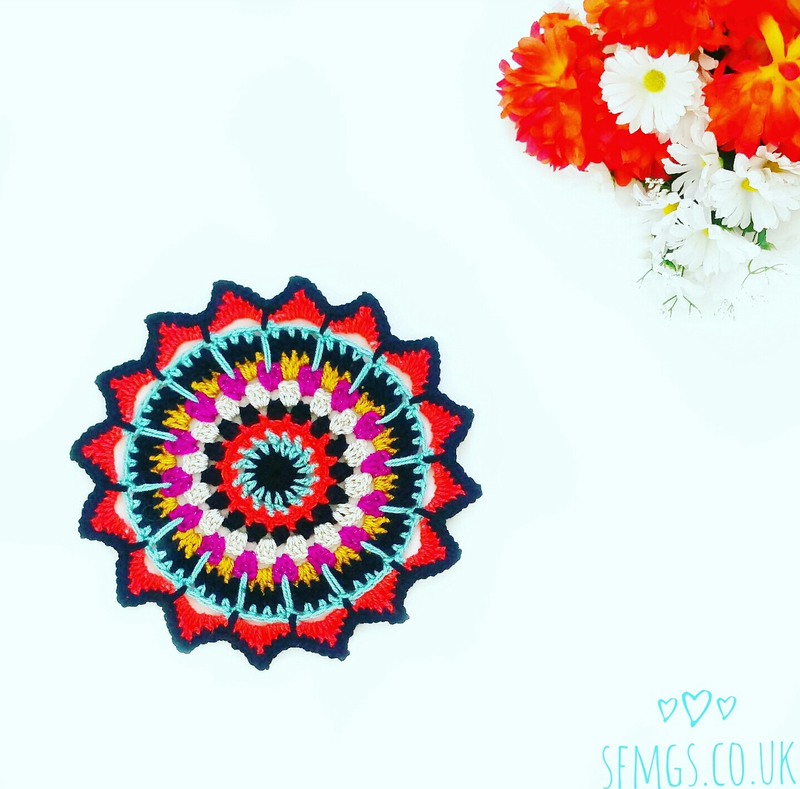 Made using snuggley black Stylecraft Special Aran for added texture and a 4mm crochet hook to pull those stitches close together for added depth, this crochet Mandala also uses Spike Stitch to create definition. 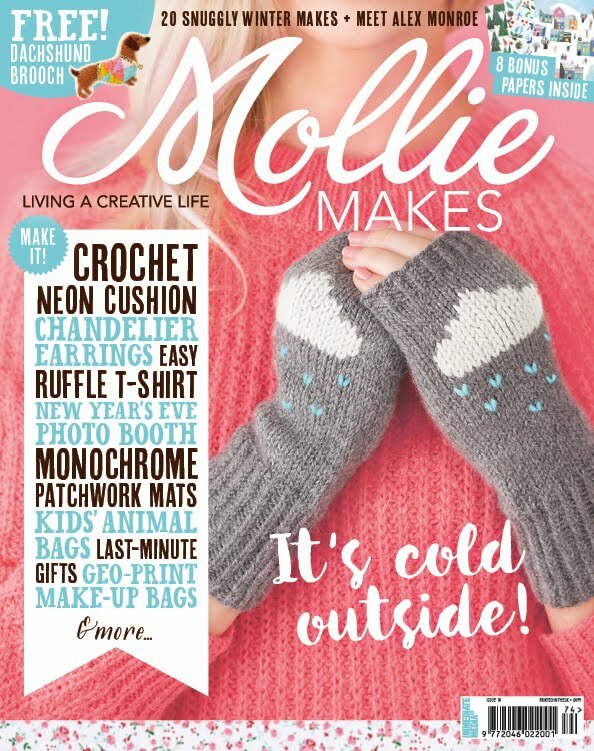 I have a real crush on Spike Stitch at the moment! 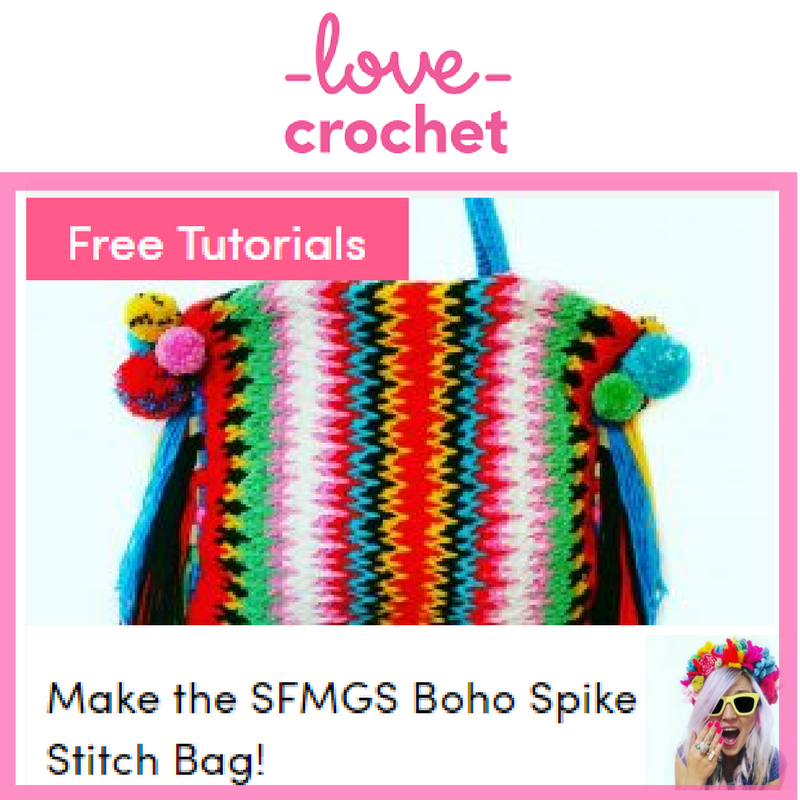 I will post a tutorial too soon for the spike stitches as if you are new to crochet it can seem scary but it is so simple yet creates an amazing stitch pattern. 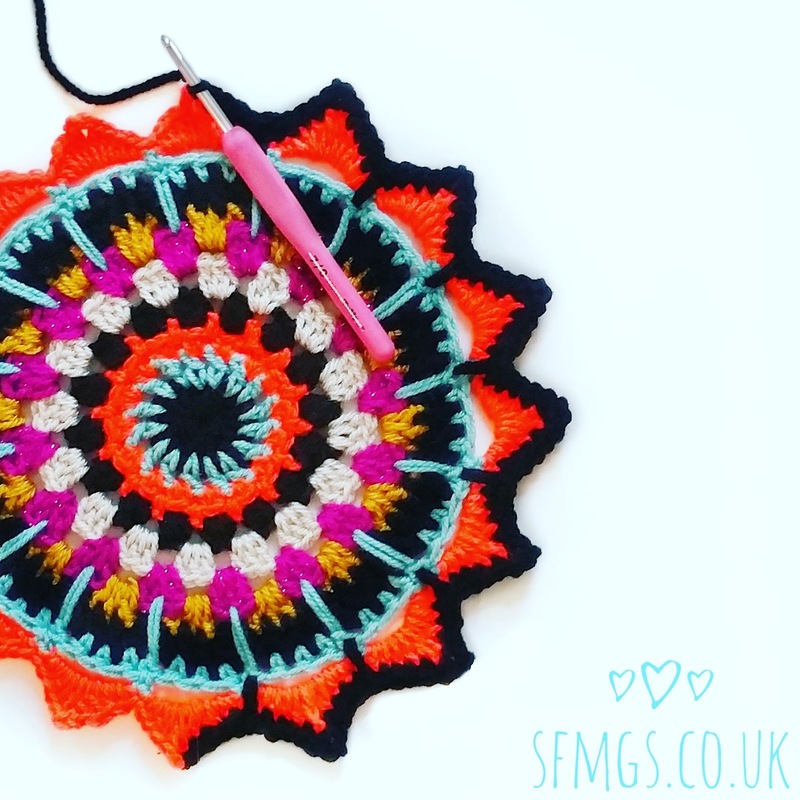 This mandala design is worked across 13 rounds and measures approx 8 inches across. 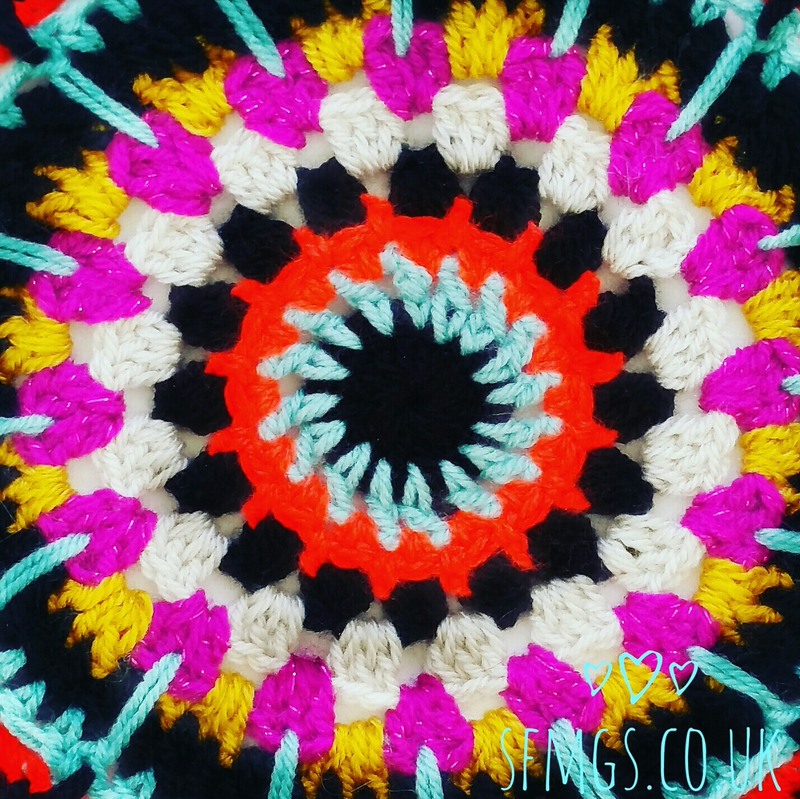 Perfect for mounting in hoops, potholders and more!! R1: Start with a magic loop and ch3 as 1st tc (US dc). 15 tc (US dc) into the loop. Join with ss and FO. 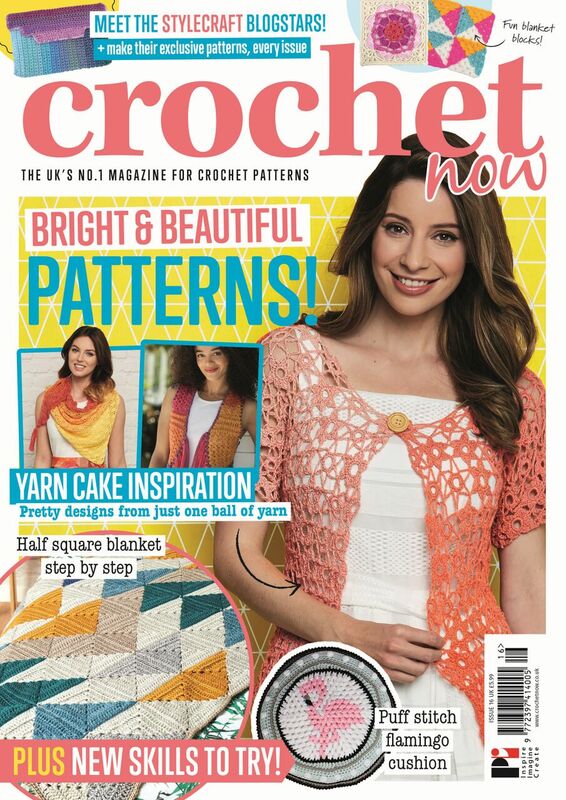 R2: Join new yarn into any st sp and ch4 as 1st tc (US dc) plus a ch1. [tc (US dc), ch1] in each st sp to end. Join with ss and FO. R3: Join new yarn into any ch-1 sp. Ch2 as 1st htc (US hdc). Htc (US hdc) into the same ch-1 sp. (2tc) (US dc) into each ch-1 sp to end. Join with ss. R4: SS into the next st sp and ch4 as 1st dc (US sc) plus ch3. Miss 1 st sp and dc (US sc) into the next ch3. Repeat [dc, ch3] in every other st sp around the work to end. Join with ss and FO. R5: Join new yarn into any ch-3 sp. Ch2 and make a puff st into the sp. Repeat [puff stitch, ch2] around the work into every ch-3 sp to end. Join with ss and FO. R6: Join new yarn into any ch-2 sp. Ch3 as 1st tc (US dc). (2tc, ch1) into the same sp. 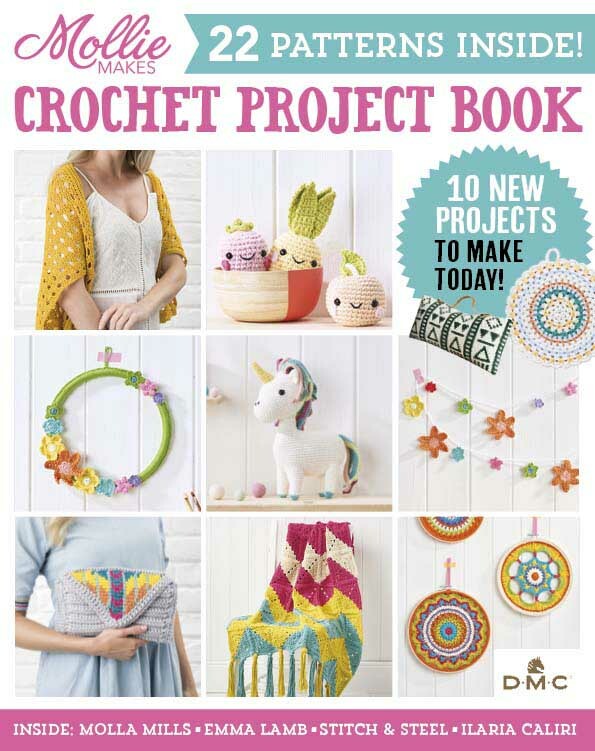 R9: Join new yarn into any ch-2 sp. ch4 as 1st tc (US dc) plus ch1. Tc (US dc) into the same sp. (tc, ch1) into the next 2 st sp. Repeat [ (tc, ch1, tc, ch1) into each ch-2 sp, and (tc, ch1) into each st sp) ] to end. Join with ss and FO. R10: Join new yarn into any ch-1 sp of the (tc, ch1,tc) R9 shells. Ch1 and SP-3 over the ch-1 sp and into the centre of R8 tc (US dc) shell. Htc (US hdc) into the next 3 st sp. Repeat [SP-3, htc into the next 3 st sp] to end. Join with ss. R11: Ch6 and dc into the top of SP-3 stitch. 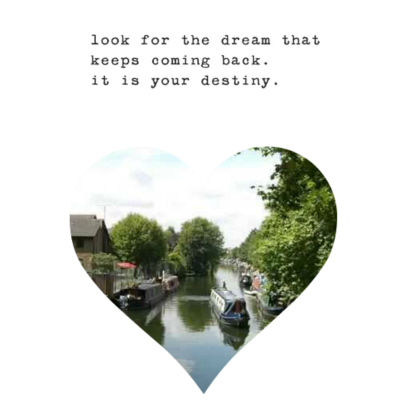 Repeat [ch6, dc into SP-3] to end. Join with ss and FO. 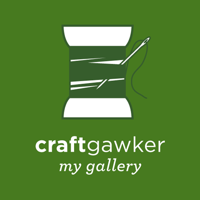 R13: Join new ayrn into any ch-3 sp. Ch3 as 1st dc (US sc) plus ch2 picot. Dc (US sc) into same ch-3 sp. Dc (US sc) into next 4 st sp. SP-3 into top of R10 SP-3. 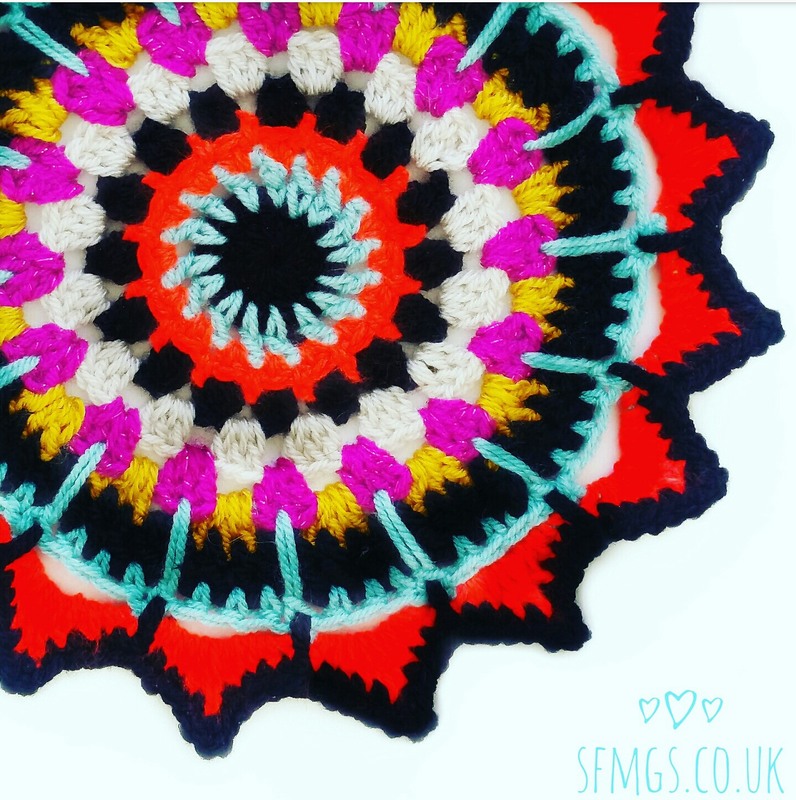 Show me your version of the Sultan Sunburst crochet mandala on Instagram by tagging me @setfreemygypsys0ul or using the hashtags #SFMGS or #sultansunburstmandala.